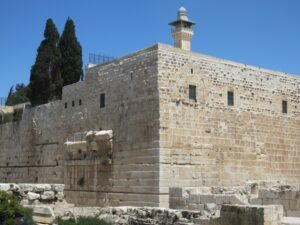 If you go to the Old City of Jerusalem… and if you visit the Temple Mount, a holy site for people of all three Abrahamic faiths… and if you go to the plaza at the southwestern corner and look down at the archaeological site below… here is what you will see. You will see large, flat paving stones from the first century, probably placed within a couple of decades after the death of Jesus. Many of those stones still lie flat and easily traversable. 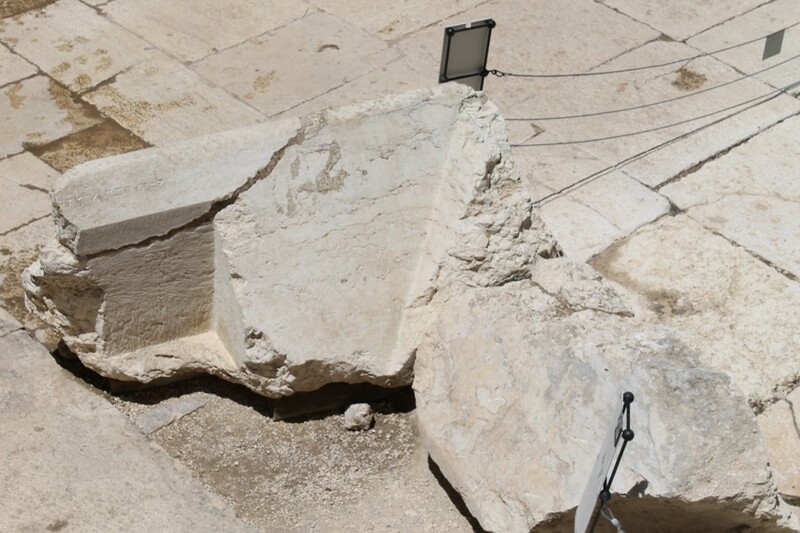 But in places, the horizontal stones are cracked, jagged, upended, dislodged by enormous chunks of limestone that were smashed from the retaining wall above when the Romans destroyed the temple in the year 70. To the place of trumpeting. 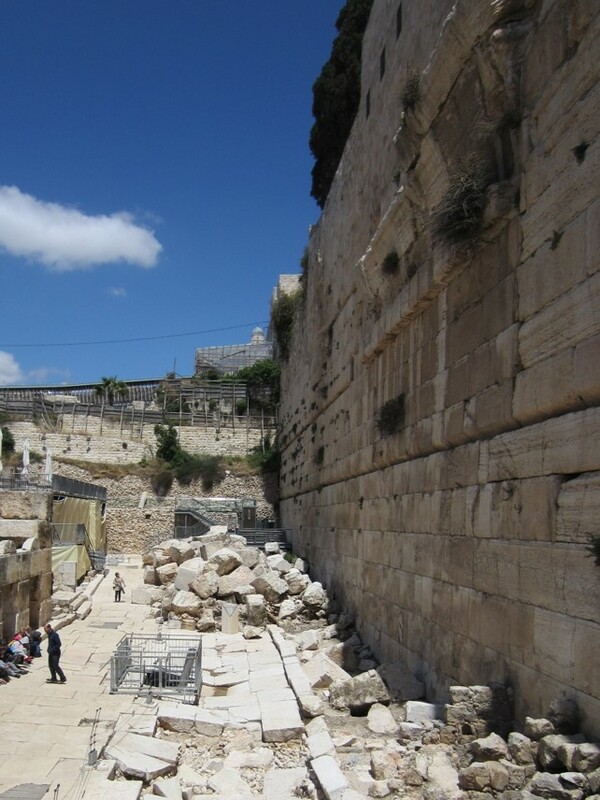 That inscription may have been a reminder or an encouragement to the temple priests—or it may have been the first-century equivalent of an address label, a note from the carvers to tell the builders where that special stone was bound. 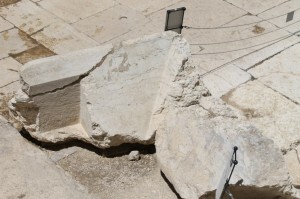 The theory is that this stone was the capstone, placed at the top of that southwest corner of the temple, at the spot where the priests would go to blow the shofar to announce the weekly sabbaths and yearly festivals. The holy days would be welcomed with the sound of trumpets and the sound of the horn—with a joyful noise before the Lord. 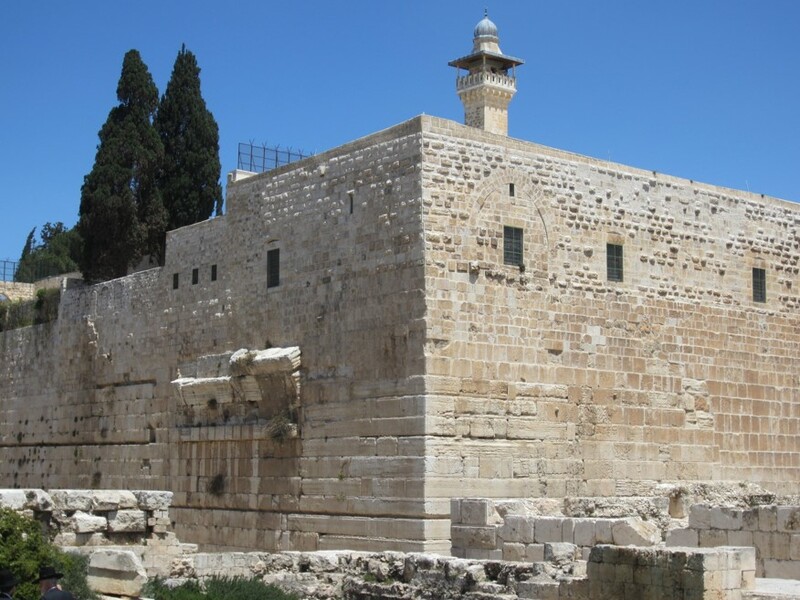 Now, as far as I know, there’s nowhere in this sanctuary that’s labeled the place of trumpeting… but two thousand years after that stone was thrown down from its perch, music is still central to our worship. When we gather, we praise God with the sound of organ and bell and voice—with hymns and anthems, with classical and bluegrass, with guitar, and bass, and fiddle, and piano, and lots and lots of singing. That is to say, we still worship God in the style of Psalm 98. “Make a joyful noise to the Lord, all the earth!” the Psalmist cries. “Break forth into song and sing praises! Sing praises to the Lord with the lyre, with the lyre and the sound of melody. With trumpets and the sound of the horn, make a joyful noise before the King, the Lord!” This is an all-inclusive call to praise, a sort of universal “All God’s Critters Got a Place in the Choir,” a summons to sing that leaves no one out. It includes not only people, but the whole natural world, the sea and the hills. There are no prerequisites of music theory or voice lessons; there’s no one there to tell you that you should just mouth the words if you can’t carry the tune. The Psalmist bids the earth itself to praise God—and if water molecules and piles of dirt can praise God, then you better believe you can, too. If that’s all this psalm had to say, it would still be a lovely prayer for this day. But it turns out there’s more to it than first meets the eye. If you look at the original Hebrew text of this psalm, you will discover that the word we translate as “make a joyful noise” can also sometimes mean “to cry out in distress.” The same word that often signifies triumph can also signify alarm. Not only does this psalm include all creation in its call to worship—it also includes a variety of experiences in which we might call on God. For whether we are full of joy or full of distress, we are invited always to lift our voices to God. And there’s more. The word in question sounds an awful lot like another Hebrew word, the one for breath, spirit, wind. The word here is ruah (רוּעַ); the other word is ruach (רוּחַ). Just one letter; just one small sound. And although the etymologists tell us that these two words come from distinct roots, that they are not actually sisters, I can’t help thinking that a Hebrew-speaker would have heard that resonance and noted its implications. In Hebrew, as in English, there are other words for singing, speaking, crying, shouting—but the one used here, ruah, sounds an awful lot like the word for breath or spirit, ruach, and I suspect that it just may have been on purpose. When we sing together, we breathe together—and in that moment, as our breath becomes one, our spirits follow suit. In fact, a study in Sweden two years ago found that when people sing together, not only do they breathe at the same time, but their heart rhythms start to synchronize. When we sing together, we breathe together—we become one breath, one spirit, one body, the Body of Christ. When we sing together, we breathe together—we con-spire, and our wills become united with one another and with the will of God. And there’s yet more. This word, ruah, is not used only here. It shows up elsewhere in the Bible, and when it does, it is often what scholars would call an “efficacious word,” a word that makes things happen, a word that gets things done. It shows up, for example, when Joshua and his army surround the city of Jericho, and the circle it seven times, and when Joshua gives the signal, they all shout (ruah) together, and the walls of the city fall right down. When we breathe together, when we lift our voices together, not only are we united, but we also become powerful. So today, as we celebrate the gift of music and all the ways it unites us, the question before us is this: What will we do with the power of our song? For whom will we sing of comfort in the midst of distress? For whom will we sing of freedom from captivity? For whom will we sing of God’s steadfast love and faithfulness? For whom will we sing of God’s coming realm of righteousness and equity? It is not enough to sing the same old songs, no matter how we love them or how comfortable they are. We are called to sing to God a new song, for God is still at work in our world, still loving, still saving, still speaking, still singing. And whether we are in the place of trumpeting, on the pinnacle of the temple… or whether we have crashed to the ground… or whether we are just in the midst of our ordinary, everyday lives… God needs our voices to join the chorus until fields and floods, rocks, hills, and plains, repeat the sounding joy—until heaven and nature sing.